The Whitney Biennial 2017 includes works from five alumni of the School of Art. Oto Gillen A'08, James N. Kienitz Wilkins A'07, Torey Thornton A'12, Casey Gollan A'13 and Victoria Sobel A'13 have all been selected for the prestigious showcase of contemporary art open March 17 until June 11. It will be the first Biennial in the Whitney's new location. Oto Gillen's Biennial project, "New York, 2015 —" is a video projection that, "documents the denizens of our sanctuary city’s public spaces — homeless people, food vendors, police officers, bike messengers — presenting a combination of striving and defeat (and surveillance). Providing contrast are shots of the luminous nocturnal beauty of skyscrapers under construction that will do nothing to succor the lives below," Roberta Smith writes in her review of the show in the New York Times. James N. Kienitz Wilkins works primarily in film and video. 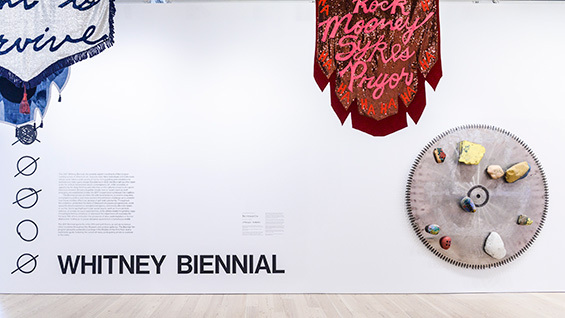 The Whitney Biennial website describes the featured works as, "Reflecting on the intersections of race, class, and technology, Kienitz Wilkins’s featured films take the legal systems as a starting point, and incorporate strategies of formal experimentation with language and performance." Torey Thornton works primarily in sculpture and painting. In an interview with Dazed he described his practice: "Both my sculptures and my paintings sit in a space between abstraction and figuration, or more recognizable elements. I'm always playing with what the perception of things in the work are, and attempting to build imagery or objects that go in and out of focus in a way." He will have two pieces in the exhibition. "Painting," a 2017 work, uses a large circular saw blade as its surface to which he affixed painted rocks and hardware. "What Is Sexuality, Is the Scale Infinite Similar to a Line," also from this year, uses a mattress and is featured in W Magazine's showcase of the Biennial's young artists. Working collaboratively, Casey Gollan and Victoria Sobel have contributed "Reflections," a site-specific work putting words and text into bay windows of the building so they are readable from the outside. The works "invite the viewer to symbolically cast a stone or traverse the text," according to the Biennial website. The wall text for the piece notes four other current or past Cooper Union students as collaborators on the work, including Owen Law, a School of Art junior, Maya Krtic AR'17, Jacob Jackmauh, a School of Art junior, and Jakob Biernat A'16.